CLASSIC Take a Guided Tour of Arnhem’s Open Air Museum to get a rare peek into the everyday lives of ancient Dutch farmers, fishermen, and craftsmen. You may join a Guided Optional Excursion to the Windmill of Thorn, or take an Optional Cooking Workshop. CLASSIC Take a leisurely Guided City Walk in Cologne for a view of its must-see sights, including the Old City and its soaring twin-steepled gothic cathedral. CLASSIC Enjoy a leisurely Guided Walk of ancient Koblenz, including a cable-car ride to Ehrenbreitstein Fortress for a spectacular panoramic view. Enjoy lunch on board and the breathtaking beauty of the Rhine Gorge as you cruise on your way to the picturesque village of Rüdesheim. Explore the Rhine River from a unique perspective on your Avalon Active & Discovery river cruise. With Avalon Choice, you’ll enjoy a wide variety of included excursions to match your interests and pace. Whether you’re a history buff, a foodie, or an art lover, you’ll find the inclusions that speak to you! Your Rhine River cruise begins in Amsterdam for a day full of activities. See the colorful corners of Amsterdam your way—from a canal cruise to a leisurely culinary walk in one of Amsterdam’s famous districts, or a guided jog-ging tour of the city—all at an easy pace! You might choose an included painting class, instead, to recreate the masterpieces of Dutch artists. With Avalon Choice inclusions, you choose how to discover fascinating sites on your Rhine River cruise. Visit the Chocolate Museum in Cologne, take a guided tour in Düsseldorf to discover its spectacular subway, and taste regional wines in Eltville. In Koblenz, take a cable-car ride up to Ehrenbreitstein Fortress for magnificent views of the surrounding area. Onboard, you’ll pass through the magnificent Rhine Gorge and enjoy specialty dishes while cruising. 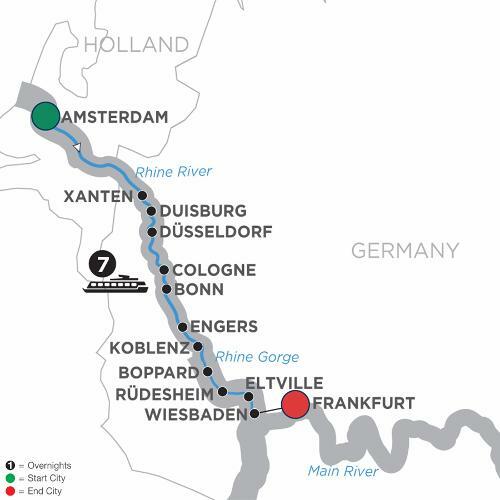 Join us for a Rhine River cruise like no other, with more included selections for every taste, passion, and pace. Avalon Choice on Active & Discovery river cruises gives you the Active, Discovery, and Classic inclusions to see each destination your way! Gateway for departure is Frankfurt, Germany.